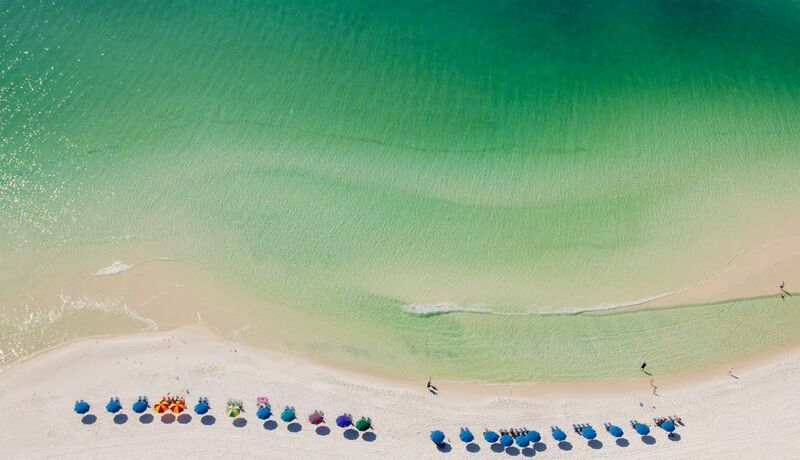 With sand like powdered sugar and the brilliant turquoise Gulf of Mexico, Destin is a gem on the Emerald Coast, the panhandle of northwest Florida. It's a perfect place for a family vacation with a full range of kid-friendly attractions. There are traditional beach activities like sand castle building, walking the boardwalk, and fishing. But you can also head for a waterpark for the day, drive a go-kart, and go flyboarding. There's something fun to do for all ages in Destin. While each of the 12 beach access points on Destin's coastline will bring you to a beautiful stretch of sand, the 1.5-mile Henderson Beach State Park is a singularly impeccable waterfront paradise where you might spy dolphins, sea turtles, or migratory birds. There are 30-foot white sand dunes, natural vegetation, and a large campground. You can experience camping in a protected natural area connected to the beach via a boardwalk. No trip to Destin is complete without a stroll along the Destin Harbor Boardwalk. Watch the charter boats bring in their catches, discover great restaurants and ice-cream shops, and go people-watching. This is also ground zero for a multitude of water activities, from day cruises and parasailing to jet ski and kayak rentals. Take a two-hour sandcastle-building lesson from Beach Sand Sculptures, and learn professional sand-sculpting tips and techniques (including exactly how much water to add to the sand to create a perfect mixture). In the end, your family will have an amazing sandcastle that makes for a perfect photo op. When your kids clamor for a waterslide, take them to Big Kahuna's. You'll find over 40 splashy attractions, including raft rides, ​body slides, surf simulators, pipeline slides, and a lazy river, as well as a kiddie section with a pool and slides just for younger kids and a mini-golf course. Living up to its title of "the world's luckiest fishing village," Destin offers many different ways to catch a fish, be it from a charter boat, pier, kayak, or beach. One of the easiest and least expensive options in the area is the Okaloosa Island Fishing Pier, where you can rent poles, bait, and tackle for a pittance. Kids 5 and under can fish for free. To see dolphins frolicking in the waves of the Gulf of Mexico, the Sea Blaster offers two-hour dolphin cruises and three-hour combination cruises that include 90 minutes of snorkeling. Free beverages are served and kids can take a turn driving the boat. For free alligator shows on the weekends and the chance to safely feed a gator with a bait pole, head to Gator Beach at Fudpucker's, an iconic kid-friendly restaurant that's a must-stop when in Destin. You can dine on southern favorites such as hushpuppies and shrimp. And, yes, alligator is on the menu too. Nearby in Fort Walton Beach, the Gulfarium Marine Adventure Park is a small aquarium with seal and dolphin shows, touch pools, and animal feedings, as well as a variety of animal encounters that bring kids up close to sea lions and other flippered friends. Encounters should be booked in advance. If you need a break from the beach, head to The Track Family Recreation Center for go-karting, mini golf, bumper boats, bungee jumping, and more. There's also an arcade and a kiddie section with a mini train, carousel, and other tame rides for little ones. For adults and teens 16 and up looking for an adrenaline rush, Power Up Watersports offers the latest craze of flyboarding, where you soar through the air thanks to jet-pack-equipped boots. Looking for something tamer? You can also rent aqua trikes, kayaks, and paddleboards. Destin Snorkel offers tours with instruction and snorkeling gear. Their very popular 3-hour tour offers a variety of activities: snorkeling, shelling, and dolphin viewing. You'll go out on their boat and stop in two places. At one stop, you'll leap into the bay to find shellfish and crabs. At the second stop, you'll go snorkeling to find fish. Also on board for guests are single and double kayaks and on the tour, they take you out into the Gulf and hope to spy some dolphins. At the Destin History & Fishing Museum, you'll find exhibits with information on the history of the town and its fishing industry. They are set up for families with scavenger hunts and personalized tours. Inside the museum, you can see 75 mounted species of fish and fishing equipment and photos of the early fishing village times on the Gulf coast. You'll also learn why Destin sand is so white. The outdoor museum and historic park complex have the historic seine boat "Primrose," mullet boat "Lil Jimmy," and the original Old Post Office. Ages 5 and up can ride a Banana Boat with Mobile Sports. You'll zoom around the Destin Harbor and out to open water on a bright yellow Banana Boat towed by a 21-foot ski boat. After the banana boat ride, you'll get back into the speed boat and finish the exciting tour. One-hour Banana Boat rides cost $45 to $55 per person. Lucy Anne Buffett, sister of musician Jimmy Buffett, is also known by her childhood nickname LuLu. She brings a fun and funky atmosphere to her restaurants that are fun for kids and adults alike. You'll enjoy traditional southern-style seafood (also found on the kids' menu), live music, and a casual waterfront atmosphere. How about a "Brownie in Paradise" for dessert? What Are the Best Hotel and Day Spas in Florida?